"Beautiful handmade edible centerpieces & vegetable wreaths!" 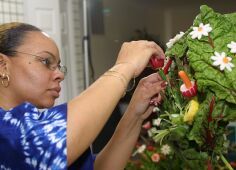 The art of making vegetable bouquets was mastered by Geri Schwandt over a period of about 15 years. Geri was a creative cook who went out of her way to make food delicious, different, and beautiful. What her friends and family remember most about her is that they could not leave her home without a loaf of homemade bread or some other sumptuous treat. Her signature creation soon became her "vegetable flower bouquets". Friends, family, and neighbors adored them at birthday parties, weddings, church functions, and dinner parties. Geri left this earth on December 30, 2000, as the result of injuries sustained in an automobile accident while in route to a Deaconess conference. Since then, Jennifer Schwandt-Gayle has carried on the tradition of creating beautiful edible floral arrangements that are sometimes arguably too pretty to eat! Guests often need to be encouraged to take the beautiful flowers and enjoy them at their elegant affairs or simple dinner parties. Geri's daughters, Sonia and Jennifer are currently working on a "how to" video that will be available through this site. This video will enable anyone at any cooking skill level, to create a beautiful edible centerpiece from fresh garden vegetables. Geri always thought that this craft was the perfect way for families to get together, enjoy each others company and create something beautiful that came directly from nature. We hope that you will enjoy our bouquets and other centerpieces. If you would like to learn to create them yourself, we can help you. Visit our site often to get more information about personal workshops for groups of 5 or more, a "step-by-step how to" book, and a "how to" video coming very soon. Please feel welcome to contact us via phone or email. "I pray that each of you will have as much fun and joy in your life as I have in mine. Only with the help of the Father who came and gives gentle guidance and wisdom, by the persons and places He brings into our purview and space when He alone believes it is the time."